DATA 20 corporation has introduced its new line of four peripherals for the VIC-20: Video Pak, Printer Interface, Expansion Chassis, and Memory Cartridge. All are designed to give the VIC-20 added capability at an affordable price. The Video Pak cartridge plugs right into the VIC-20 expansion port, instantly giving a standard 24-line display with a choice of 40 or 80 upper-and lowercase characters. 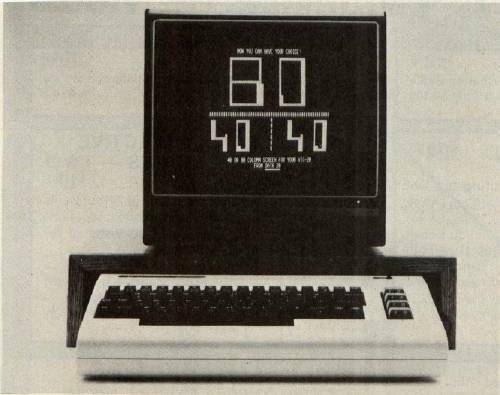 It also increases memory from 5K to 20K or even 70K, enabling the VIC-20 to run Commodore business software. Video Pak also includes a terminal emulator and screen print feature. Screen display options with Data 20's Video Pak Cartridge. Printer Interface matches the VIC-20 to most popular printers and gives a continuous visual monitoring of the data transfer functions. Status lights indicate if the printer is hooked up, if the buffer is full, and if data is being transmitted. The Printer Interface comes complete with cable and connector and needs no assembly. Expansion Chassis lets the VIC-20 run a series of four compatible memory, software, or game cartridges with the standard 22 pin edge connector at the same time, while protecting the VIC-20 power supply with a built-in 500ma fuse. Memory Cartridge boosts the brainpower of the VIC-20 to 20K and features 200ns RAMs for added reliability. Housed in a rugged plastic case, the Memory Cartridge is an ideal first add-on to any VIC-20.